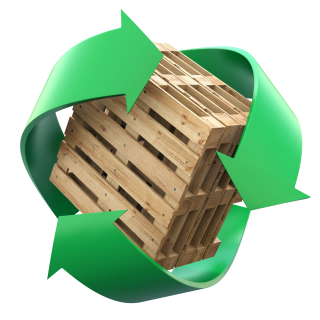 CJS are using the online Carbon Calculator launched by TIMCON (the Timber Packaging and Pallet Confederation) to revolutionise the way our customers can calculate and estimate the carbon intensity of their pallets. Using wood has always been seen as positive and now we can actually measure those benefits. With the ever increasing focus on sustainability and with more and more companies assessing the carbon footprint of their business, the Carbon Calculator has proven to be an invaluable tool. As a tree grows, CO2 is absorbed from the atmosphere and stored as carbon in the tree meaning that the wood has a negative carbon intensity. CO2 emissions associated with harvesting, transportation and manufacturing processes are heavily outweighed by the amount of carbon that the tree stores. Other materials such as plastic all require significant energy for the extraction of raw materials and manufacturing of the end product and as a result, have a positive carbon footprint. When the carbon footprint of both wood and non-wood products are compared, wood products are shown to significantly save on greenhouse emissions. Additionally wood can be recycled for energy recovery, which has the added benefit of displacing fossil fuels. We are very focused on reducing our carbon footprint and that of our customers. It really is crucial that the repairable, recyclable and reusable qualities of wood are detailed and understood. In terms of health, safety, economic and environmental benefits wood is still the clear, preferred leader.